The pundits of the bourgeoisie include China in their collection of economic ‘powerhouses’ known as the “BRICs”. This also includes Brazil, Russia and India, which are all supposedly going to be the salvation of crisis-ridden capitalism. These countries are painted as being at the other end of the scale to the “PIIGs” (Portugal, Ireland, Italy, Greece and Spain). In reality, they’re just two sides of the same coin. The PIIGs have fallen far and fast into open economic crisis, the BRICs are about to, thereby extinguishing the faint hopes of the ruling class of an economic miracle capable of overcoming the mortal crisis of the capitalism. As the ICC's International Review 148 says: “The 'emerging' countries, like India and Brazil, are seeing a rapid reduction of activity. Even China, which since 2008 has been presented as the new locomotive of the world economy, is officially going from bad to worse. An article on the website of the China Daily on December 26 said that two provinces (one being Guangdong which is one of the richest in the country since it hosts a large part of the manufacturing sector for mass consumer products) have told Beijing that they are going to delay the payments on the interest on their debt. In other words, China is faced with bankruptcy”. In an ominous development for the Chinese economy – and for capitalism more generally – there is a massive building boom/bubble swelling up which, like those in the USA, Ireland, Spain and elsewhere, can only burst, with dire consequences. There is a vast overcapacity shown in the hundred odd million square feet of unusable and unsellable building space in Shanghai. Housing here and in Beijing is priced around 20 times more than an average worker's annual pay. 85% of workers who need one, can't afford a new home. The regime has tightened credit because of rising inflation so, just like Britain, the USA, Ireland, Spain, etc., the soon-to-deflate bubble will threaten the banking system, particularly China's version of ‘sub-prime’, the unofficial grey market banking system financed by the large state-owned businesses of the regime. These losses in turn will adversely impact on the important local authorities of the state who will be unable to meet their obligations. Far from being a beacon of hope, the developing global crisis of capitalism means even more that the Chinese economy is just another factor of capitalist despair. Developments in working class struggle in China show that it is fully a part of the global wave of class struggle and social protest that has been building up since around 2003. Also, because the extent and depth of the struggles, which now involving second-generation, largely literate migrant workers, events in China have a great potential. Not as an expression of bourgeois self-delusion in any ‘economic upturn’, but to as an important beacon for the world proletariat in the development of the class struggle. The thousands and thousands of reported “incidents” of strikes and protests in the cities, along with unrest in the countryside are growing in number and intensity. 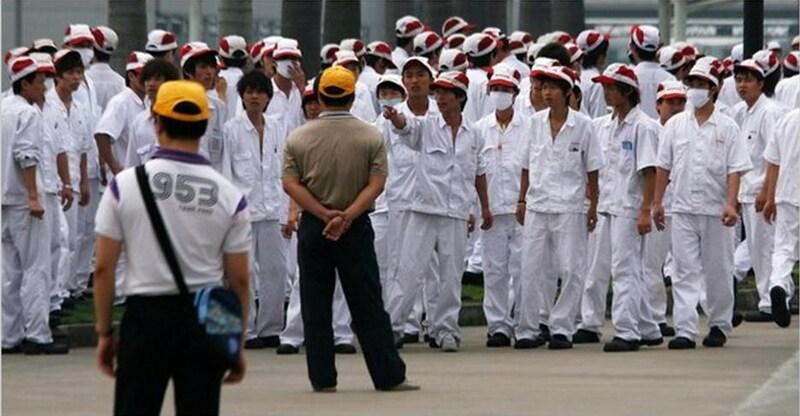 Strikes are getting bigger: the three-day strike early in January in the industrial zone of Chengdu, was, according to The Economist (2/2/12) “... unusually large for an enterprise owned by the central government”. Here the workers gained a small increase of around $40 a month, but buying off strikes in such a way, along with overt repression, is no longer sufficient. The media black-out of unrest is no longer enough given the use of microblogs. The frequency of strikes at privately owned factories has also increased in the last year. In the Pearl River Delta, which produces about one-third of Chinese exports, thousands of workers in Dongguan last November, protesting against wage-cuts, took to the streets and clashed with police. Photos of injured workers appeared on the internet. In the last few weeks there have been more protests here. The Economist continues, observing recent and developing protests in Guangdong, as taking on a different form, in contrast to the settled and peaceful strikes that took place here in 2010: “...these days, rather than bidding to improve their lot, workers are mostly complaining about wages and jobs being cut. The strikers seem more militant... A report published this month by the Chinese Academy of Social Sciences, says that compared to 2010, the strikes of 2011 were better organised, more confrontational and more likely to trigger copycat action. 'Workers are not willing this time to accept that they have to make sacrifices, and secondly, fewer are willing to pack up and go home’”. Repression is still the main weapon of the Chinese state – non-uniformed police are everywhere. But there are dangers in this policy. When a pregnant worker was manhandled by the police in Guangdong recently, thousands of workers attacked the police and government buildings. These workers are unlikely to go back to being settled peasants particularly when the countryside is raising its own form of protests against the effects of the crisis – as in the village of Wukan recently. There are a hundred and sixty million migrant workers (20 million lost their jobs when the economic shock-waves of 2008 hit China) and they are living in the cities. There is nothing for them to go back to and, given that, as migrants, they are supposed to pay for their children's education and family healthcare (which companies are supposed to pay for, but like the minimum wage is largely ignored), another area of class conflict has opened up. The world economic crisis is deepening and this will have a significant effect on China and its economy. Given the present and developing levels of class struggle in this country, we should expect to see further developments in the struggles of workers in China, building on a number of strikes and protests reported in January. Internationalism is the only solution to the Kurdish Question!